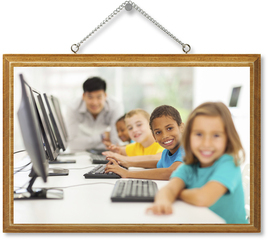 EduFirst® Technical Academy offers both full and part-time education options for families of students grades K-9th. We encourage parents interested in our center to schedule a private tour. Please contact us at: 678.379.9145. If you have already toured our facility and are ready to print and complete our registration form, click here. This form must be returned to us with a one-time annual fee of $65.00 (non-refundable) before August 1st. Parents are encouraged to use our online registration system to enroll and pay the registration fee to hold their child’s space as seats fill quickly. You may also fax registration form to 770.892.3499. 1. Bi-Weekly Payments: Tuition fees are due every Friday prior to the week of service. Tuition is due whether the child’s absence is due to illness, school closure or inclement weather. If you pay bi-weekly, tuition is due before service is rendered. All payments are due on Fridays prior to the Monday start date. 2. Monthly Payments: If you pay monthly, your payment is due on the 1st of every month. Tuition is due whether the child’s absence is due to illness or inclement weather. EduFirst TA accepts cash, money orders, credit/debit cards or checks. There is a $5 credit/debit card processing fee. Late payments will be assessed a $10.00 per day late fee up to 5 days. After which time, student will not be allowed to attend EduFirst TA until all delinquent fees are paid. Sibling Discount: We are pleased to offer a 10% tuition discount to siblings who enroll concurrently.